You will find all kind of strange things on the Internet If you know how to say "hypnosis" in Russian; this is one of them. 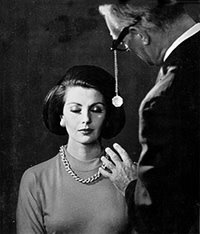 Digging deep on Google I found this image of the moment just before this beautiful lady enters a deep hypnotic sleep. And there is something in the way her attention is caught on the hand of the hypnotist, on the intensity of her gaze and her vulnerability, that we find here at the Hypnotic Society extremely beautiful. Looks like Rasputin to me. Whatever it is that you are looking for in a hermes handbags , luxurybagsshop.com has the answer. It is just the right place top enter for that elusive Hermes Evelyne design and style you have been researching for. Discounted hermes scarf are also items at the online handbags store.